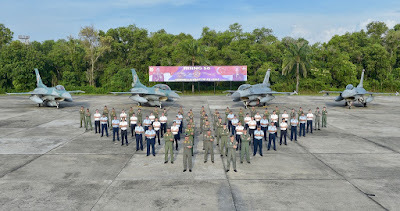 Following the combined flypast over the Marina South area in Singapore, all the participants of the flypast, members of the organising committee, senior officers and four F-16s from the Republic of Singapore Air Force (RSAF) landed in Roesmin Nurjadin Air Force Base, Pekanbaru, Indonesia to join the Indonesian Air Force (TNI-AU) in a post-flypast celebration to commemorate the 50th anniversary of diplomatic ties and close friendship between the two countries. Chief of Air Force Major-General (MG) Mervyn Tan and Chief of Staff of the TNI-AU Air Chief Marshal (ACM) Hadi Tjahjanto were on board their respective air forces' F-16 fighters for the combined flypast earlier this afternoon. Sharing his thoughts after the combined flypast, MG Tan said, "It is the first time that both our air forces have come together to do a flypast of this complexity and scale. I think the flypast is really a testament of the skill as well as the professionalism of the pilots of our air forces. More importantly, it underscored the trust and mutual understanding between the personnel of both our air forces. I would like to say that, on behalf of the RSAF, it is really our honour to be able to celebrate this significant event in such a special way together with our Indonesian friends." ACM Hadi added, "Today is a special day for us. This achievement is a reflection of the strong relationship between us and the high level of trust that is shared between the personnel of the TNI-AU and the RSAF. I believe the military cooperation between the TNI-AU and the RSAF will be everlasting and we will always support each other." As part of the celebration, personnel from both air forces exchanged memorabilia to mark the close and long-standing bilateral relations between the two air forces. The RSAF and TNI-AU first started exercising together in 1980, and since then the two air forces had also engaged in a wide range of exercises and activities such as visits, professional exchanges and cross-attendance of courses. These regular interactions enhance the interoperability and foster mutual understanding between the RSAF and TNI-AU. ditunggu rising 100, wah uda pake f35 ape ifx yak haha! kan stnknye beda om, ntar jg kalo perpanjangan ketauan lho haha! Konon dinegri kita ini banyak tukang "gendam/hipnotis"...lha kalo latma sm singapur disini, mbok sekali-kali mereka diundang. 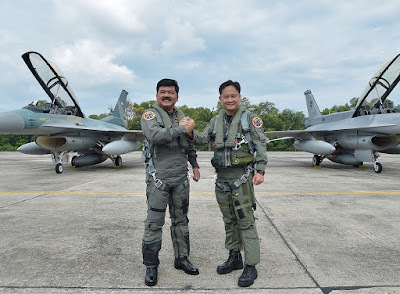 Misalnya 10 F-16 singapur latihan disni, pas mereka dah mo pulang, pilot2nya dicablek/ditepuk satu-satu pundaknya..."koh pesawatnya yang itu lho" (yang loreng hijau-putih). "Oh iya-iya, kamsia...sampe jumpa lagi". Ridho nih bang...gak jadi beli sukhoi? Kalo "disebelah" nama sampeyan basith bukan om...? Grippen dengan promosi katanya full TOT sepertinya lebih menjanjikan mas.. Indonesia lebih butuh ilmu baru sepertinya untuk menunjang progam IFXnya...F16 cukuplah sampe block 52. Kalau ada Grippen kan bagus buat nambahin SDM teknisi2 kita ?.. Btw pesawat sukhoi atau mig yg kelas medium fighter spt Grippen atau F16 kira2 apa ya mas ? Kalau ada boleh juga tuh jadi bahan pertimbangan. Nama ID ente di kaskus apa? Nah mulai galau kan murite ayam jago...percaya kok sama ayam, musyrik bang!! blom tau de power of emak2 & mbah...tolong di berih dong om smilikity haha!